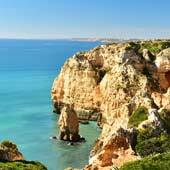 Lagos is a fascinating and historic city that is situated on the beautiful coastline of the western Algarve. The nearest international airport to Lagos is Faro airport, but this is 92km to the east of Lagos. 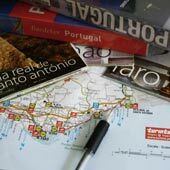 This considerable distance means that it is advisable to plan your onward transfer before arriving in Portugal. This guide will provide an overview of travelling from Faro airport to Lagos, with information about private transfers, shared transfers and public transport. 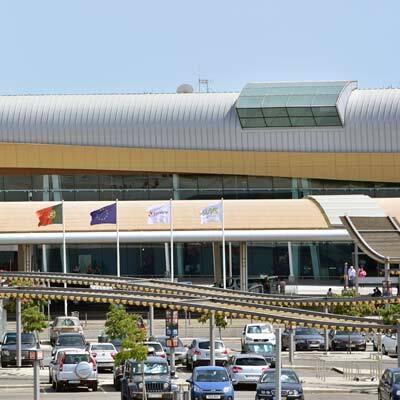 Public transport from Faro airport is very poor, especially when considering that Faro is an important international airport and that the Algarve’s primary industry is tourism. There is no public transport hub at Faro airport and all onward journeys by bus or train need a connection in the city of Faro. 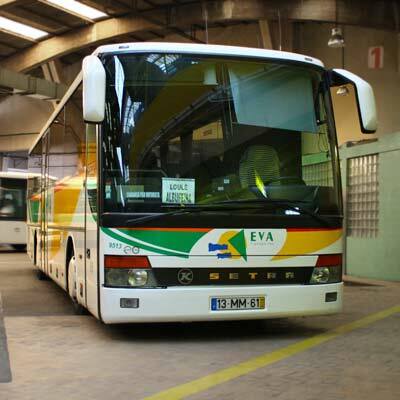 From Faro city, there are direct but infrequent buses (2h10min) or trains (1h50min) services to Lagos. All stages using public transport have very limited daily departures and the total journey times, including connections, can be very long. 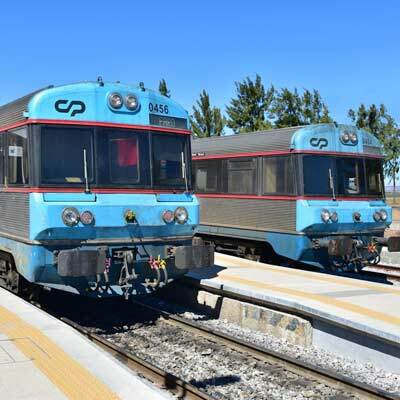 The other inconvenience of using public transport is that the last train departure is at 20:38 (please see the link to timetable later in the article), which means that if you are landing later than 18:00 a private or shared transfer will be required. The main advantage of using public transport is that it is very cheap. Unlike many of the other Algarve towns, Lagos train and bus stations are actually in the city centre. This entire journey is explained in detail later in this article. The beaches of Lagos are worth the effort! Faro airport may have had a recent expansion and modernisation, but public transport is still rubbish! Should I just get a taxi? No, a taxi hired directly from the airport arrivals lounge to Lagos will be very expensive, at around €100; the 2019 daytime taxi rate is €0.94 per km or 20% more at the weekends or night, plus there are luggage and toll surcharges. Uber has arrived in the Algarve, but due to the distance from the airport to Lagos even an Uber journey will be expensive. A much better option is to pre-booked a private transfer, which costs €71/€142 (one way/return). Advice: It is worth paying the additional toll fees and travel along the A22 expressway, as the alternative route follows the N125 and has many roundabouts and is often clogged with heavy tourist traffic. Shared transfers are cheaper than a private transfer, and the fare from the airport to Lagos is between €25- €30. Be warned, Lagos is the furthest major resort town from the airport, and shared transfer journeys are surprisingly long (80-110 minutes depending on traffic), and there are many nauseating roundabouts. Advice: During the summer, Faro is a chaotic airport, with massive queues for everything; it is always advisable to pre-book transfers. 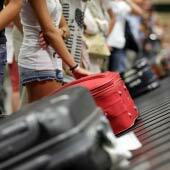 A private transfer is the easiest and fastest method of travel from Faro airport to Lagos. 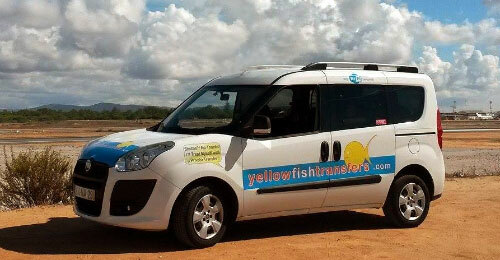 The most reliable and highest regarded (by people who live and work in the Algarve) transfer company is Yellow Fish Transfers. They operate smart, clean and safe cars and their drivers are renowned for being punctual. A transfer from Faro Airport to Lagos costs €71/€142 (single transfer/return), takes 70 minutes and the fare includes travel along the A22 expressway. 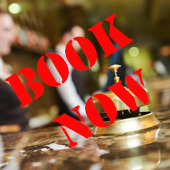 The Yellowfish website and with bookings can be found here. (The link opens new tab). So, how do we travel from the airport to Lagos? Advice: Always try to book an early flight to Portugal, as the first flight of the day tends to have fewer delays than the later flights. When we exit the terminal, we check that the number 16 bus is not going to arrive soon (see next section for bus details), but it’s so infrequent that we usually just catch a taxi to Faro city (€10-12). 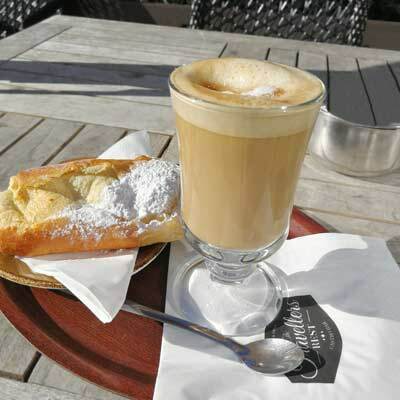 We prefer the train to the bus but there is typically a long wait due to the limited train departures and this is a great time for a late lunch in Faro. This method of onward travel to Lagos costs us less than €25 (for two) but it can take anywhere between 2h30 min or 5 hours (this does include a good lunch!). 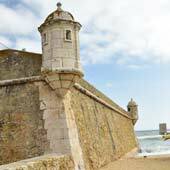 Another option is to spend a night in Faro, which is a surprisingly pleasant city, and then catch the train the following day. 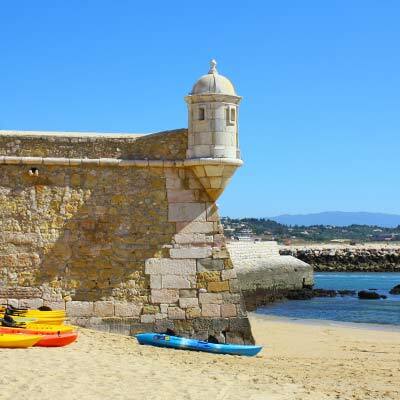 The remainder of this article will explain in detail travelling from Faro airport to Lagos by public transport, and is divided into two sections; the first details from the airport to Faro city and the second is from Faro city to Lagos. 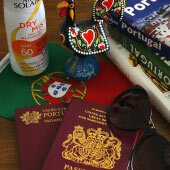 The first stage of the journey is to travel from the airport to the train or bus station in central Faro. The bus and train stations are conveniently situated close together and there is only a 200m walk between them. From the airport, there is an intermittent bus service (number 16), with at least a departure every hour from 6am to 11pm. The bus departs from outside the arrivals lounge; a single ticket costs €2.35, and is purchased from the driver. 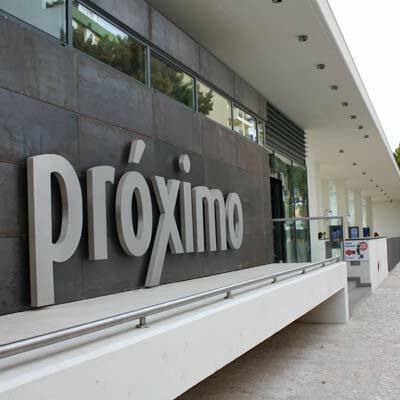 The bus ride takes 20 minutes and terminates at the Proximo bus station (GPS: 37.017307, -7.938073). 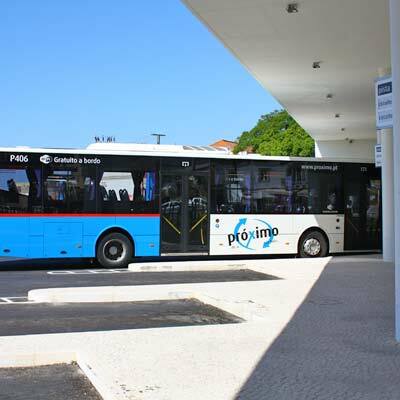 The number 16 bus also connects Faro to the beach of Praia de Faro, which means half of the buses turning up at the airport are heading in the wrong direction. A taxi from the airport to Faro train station costs €10-15, and the journey is 15-minutes. The basic four-seater taxi fare in Faro is €0.94 per kilometre and €0.25 per minute waiting (or stuck in traffic! ), and there is a minimum fare of €3.25. At the weekends or between 9pm and 6am the fares are 20% more expensive (€1.13 per kilometre and €0.25 per minute waiting), and there is a surcharge of €1.60 for luggage in the boot. An eight-seater taxi is much more expensive at €1.21 per km or €1.50 per km (night or weekends), this rate applies even if you are a group of 4 or less. Faro is connected to Lagos by the Algarve regional railway and Lagos is the final station along the line. The journey takes 1 hour 45 minutes and a single ticket costs €7.40. Tickets must be purchased from the ticket office before boarding the train. These tickets cannot be pre-booked as this is a regional train, but there is always plenty of space on the train. Faro train station (GPS: 37.018110, -7.939323) is the largest station of the Algarve but could still be considered as a very small train station, which is very easy to navigate around. 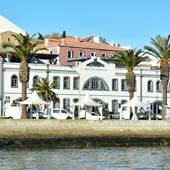 Lagos train station (GPS: 37.108539, -8.671697) is on the eastern side of the marina and only a short walk away from the city centre. 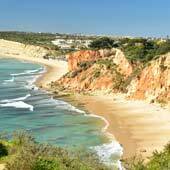 Opinion: We prefer travelling by train from Faro to Lagos, as the train journey is shorter and there are endless roundabouts around Vilamoura and Albufeira. The bus ticket must be purchased from the ticket office (the driver cannot sell tickets when in the bus station), and there can be long queues at the ticket office, especially during summer. The Faro-Lagos bus departs from the old covered bus station (GPS: 37.016861, -7.937193), which is next to the Proximo bus station. In Lagos, the bus terminates at the Terminal Rodoviário (GPS: 37.107309, -8.676388), and is very close to the city centre. Large or bulky luggage is stored in the compartments beneath the bus, and each ticket will be designated a seat number, which is printed on the ticket. Lagos bus station is 1km north of the city (on the opposite bank to the train station) and is a 5-minute walk to the city centre.